Yet another day when you didn’t exercise. Another day when you didn’t start your dream project. You didn’t quit your boring job. You didn’t begin your sugar-free diet. You didn’t meditate. You didn’t wake up early. You didn’t make your life any better than it was yesterday. “I’ll start tomorrow”, you lie to yourself. Why is it so hard to do the things you already know you should do? Why is it that knowing what’s best for you is not enough to actually do it? The truth is that, even though we have hopes and dreams, life always ends up getting in the way. We have to earn a living, we have obligations, and at the end of the day we don’t have energy to fuel the motivation needed to pursue our dreams. If you are reading this, you have probably tried to change that before. You keep reading inspiring books, watching Ted Talks, reading motivational quotes and following your role models on social media, but nothing seems to work. Beautiful pictures and breathtaking speeches or pep talks by someone else won’t do you any good if you don’t have a deeper purpose — an inner unshakable force that drives your actions from a place of deep wisdom and certainty. The good news is, this force is not that difficult to awaken. In fact, it’s dying to be heard by you — all you need to do is listen. Your journal is one of the best tools you can use to listen to this voice that will awaken your motivation. It’s an amazing tool to dive deep into your purpose, look within, and more — to use as a visual reminder of why you wanted to take action in the first place. Today, I will show you how to use your journal to light that inner fire and ignite an infinite source of motivation that will fuel you all the way towards your dreams. One of the reasons why being motivated is so hard for so many of us is because we don’t have a reason to be motivated. Let’s say you want to become better at writing, but you can’t find the motivation to start. You started writing a novel a few months ago, but now you cringe at the thought of even looking at it. What makes me want to do this? Why am I not doing it? What do I really want? This will get you to your deeper purpose. Maybe you’ll find that the reason why you want to write is because you want to share your story with the world, to inspire people with your story. You might find that writing fiction doesn’t really fulfill that, and that’s why novel writing doesn’t work for you. Maybe it will be non-fiction. Maybe a podcast, maybe a movie, or maybe even going out in the streets or shout it out loud. The point is that now you have your deeper goal. As Jim Rohn said, first the reason, then the answers. Know what you want to achieve, and let the methodology follow as a natural consequence. Verification (testing if the idea really solves the problem). This means that you might not get your goal right at first try, and therefore you should give it an incubation period. Write down your goal (or goals) in your journal, and give yourself a week to process it. Let your subconscious mind judge it. Let it sit before you jump into it. Does it make me tick with excitement? What is my deeper motivation? How will this goal keep me motivated when other goals have failed before? Let it marinate. Once you have it, you will know it — and it will make all the difference. And then, it’s time to move on. 2. Feel It. Smell It. Love It. Get Drunk With It. Having the right goal(s) is crucial, but it’s only the first step towards becoming motivated to achieve it/them. If you have failed with cultivating motivation before, you need to make sure you won’t trick yourself into procrastination again. You need to have a fail-proof method. You need to make yourself love your goals. One effective way to do it is to make your brain associate your goal with pleasant feelings. And that’s where your journal comes into play again. Go back to that page or spread where you wrote your goal, and make it into a source of inspiration. It’s time to get creative: draw, write, make a collage, do whatever it takes so that when you open your journal in that page, you will feel inspired, excited, and happy. You can use pictures, inspiring quotes, affirmations, or even the answers to the questions from step 1. The only rule is that you feel amazing when you look at it. And that’s why the next step is fundamental. According to this study, we are more likely to be motivated to take action when specific temporal landmarks take place. This is why people are so committed to New Year’s Resolutions — because they feel it’s the beginning of a new chapter, time to leave their old selves behind and start again. This is called the ‘Fresh Start Effect’. However, scientists also proved that it doesn’t have to be New Year’s or Christmas in order for the ‘Fresh Start Effect’ to work: it can be simply the beginning of a new month, or even a new week or day. Now that you have your little sanctuary of inspiration in your journal, it’s time to put it to use — after all, if it just sits there gathering dust, it won’t do you any good. All you need to do is to create a routine that will activate the ‘Fresh Start Effect’, using your goal’s spread to trigger unprecedented motivation. This can include reading it with focus, bringing it to life with your imagination, or even combining it with mindful meditation. For some of us, bringing ourselves into a planning mindset can work wonders for motivation. Check-in with your goals and see if they still resonate with you. Review your progress. Plan actionable steps for next week. If you want, you can even create a new, updated inspiring spread! The best preparation for a good fresh start is a satisfying and inspiring end of the previous chapter. Create an evening ritual where you write down all the things you already feel grateful for, and from there build the intention to be motivated for the next day. Let these be the last things on your mind when you go to sleep. Write them down. Let it sink in as much as possible. 4. Do It Before You Realize It… Wait, What? Nothing is more effective to make you motivated to work towards a certain goal than to take the first step. Just do it. Do it before you can talk yourself out of it. Start really simple. Let’s look at the novel writing example again. Just grab a piece of paper and write for 5 minutes nonstop. Next day, get inspired — read two pages of a new book. Every day, make sure you do something towards your goal, no matter how small that action may seem. The way to do this supper effective is to track your progress and make yourself accountable by taking note of your daily steps in your journal. It’s very easy: draw a calendar/board for the next month, or the next week (or the next year, if you feel super inspired!) and every day at the end of the day fill it in with what you did that day to work towards your goal. It’s super fun to look back at your accomplishments, and it will keep you pumped when you feel lazy: “Look at what I have already done — I can’t possible stop now!”, you will think. You have tried to force yourself into being motivated before, but with no results. I get you. And let me tell you this: you are not the problem. There is nothing wrong with you. It’s all about creating the right circumstances so that you can feel the right feelings, which will make motivation come effortlessly, instead of yet another obstacle to overcome in your life. Start by defining your finish line. Where you want to be, your goal, your ideal scenario. Answer the questions in point 1. Once you get that right, it’s likely that everything else will follow suit, and motivation will start being an everyday friend. Take one step at a time. Once the base is set in stone, it’s time to make it into a habit. Slowly, gently, lovingly. When you get yourself into the right mindset, you will see that life will start feeling as easy as a summer breeze. No more struggling to do what’s healthy. No more fighting yourself. You can do this — and you can do it while having a lot of fun. 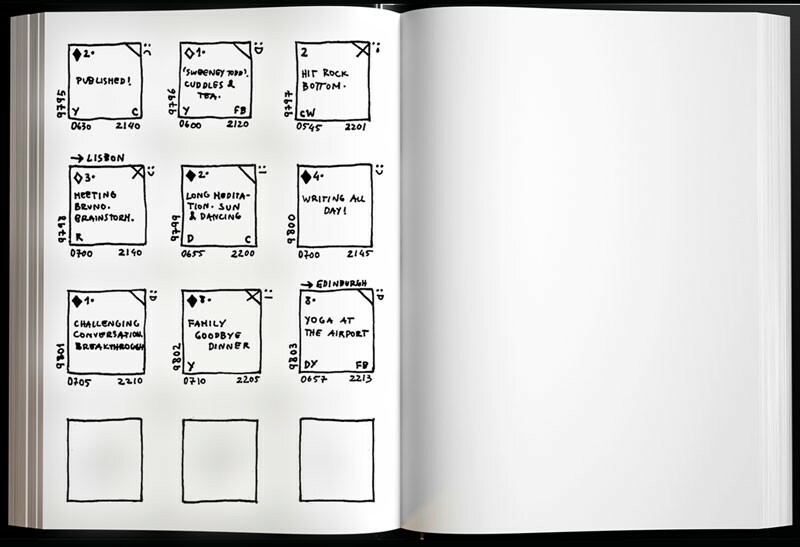 The Minimalist Journaling System—a 30-second, super simple and effective habit tracker that keeps you focused on the habits that matter. Right, you have the motivation going on. You feel excited. You’re clear on your goals. This might be the right time to start tracking your goals. If you’ve tried it before and always ended up giving up, it might be because you didn’t have the right motivation, or tried to track too many things at once. Start simple. Start with one habit at a time, and work your way up towards your goals!